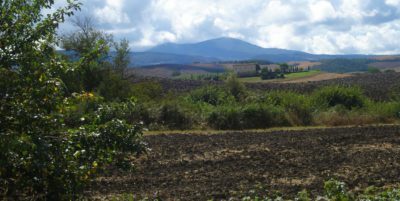 Just southeast of Tuscany lies Umbria: Italy’s « green heart » is a wonderful mix of vineyards, olive groves and tiny Medieval villages perched upon the hillside. Stunningly beautiful region waiting to be discovered. 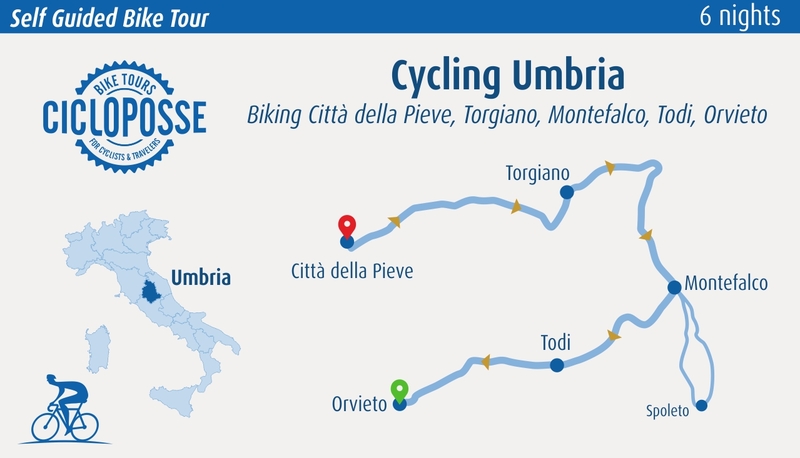 Cycle through rolling hills dotted with castles, fortresses and watchtowers harks you back to the mysticism and mysteries of the Dark Ages and visit the well-preserved medieval hill towns harboring splendid Renaissance art and Assisi, where the region’s rich history can be found at every turn. We'll meet you at charming Relais Castelluccio. 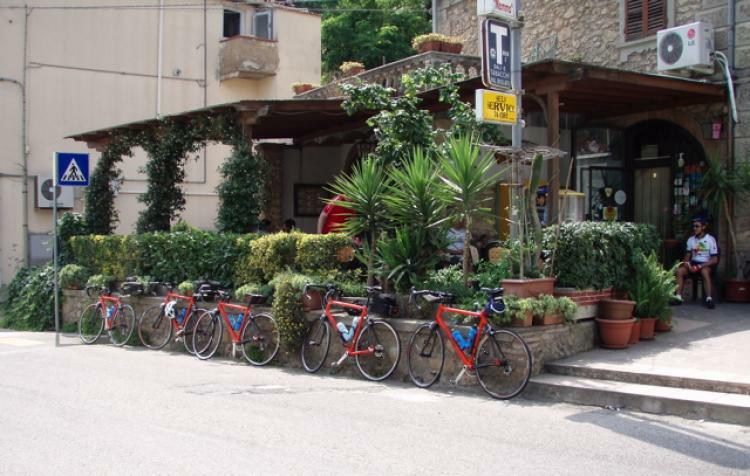 After the fitting of bikes you're free to explore this delightful hill town Città della Pieve is a town high up on a hill striking for its intense terracotta colour. At the highest point the fortress dominates with its five square towers, while the town centre is Piazza del Plebiscito. 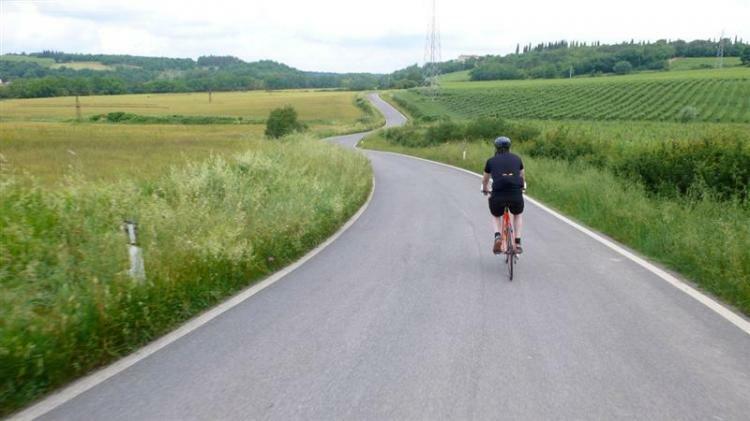 Your first tour wind past cornflower fields and isolated farmhouses, then into a series of gently rolling hills studded with minuscule towns that you'll want to stop and visit. Not-to-be-missed is Deruta the pottery town. Highlight is Torgiano with his Museum of Wine, and just outside of town is one of Italy's most prestigious and modern wineries Lungarotti. For the visitor interested in food and wine, Torgiano is a veritable treasure trove. 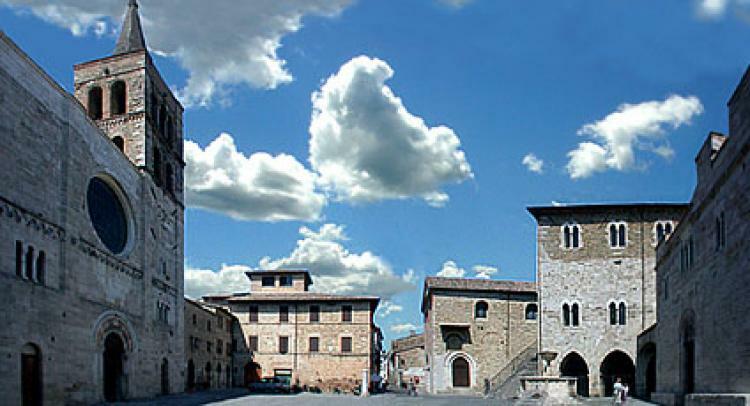 Then continue and visit Spello, the hamlet Bevagna and finally arrive to Montefalco, quintessential Umbrian delicacy: the medieval hilltown. Extremely tiny, it occupies a hilltop placed so strategically that majestic views are available at the end of every street. 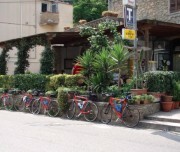 Circular Bike ride from Montefalco to Spoleto. Along the way, you breeze past a few isolated rural churches and through a couple of towns too small to even make it onto the map. The first big church is Madonna delle stelle after 7 km form departure. 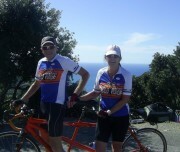 Today is very gentle hills and part of flat terrain. 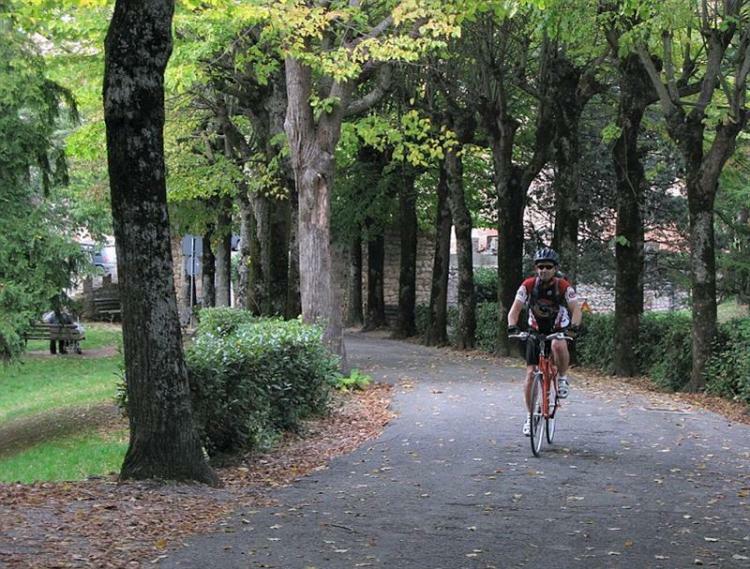 Highlight is the visit of Spoleto, within its wooded setting, is the loveliest of the Umbrian hill towns. Its urbane atmosphere is enhanced by its superb monuments and by the Festival dei due Mondi, Europe’s leading arts festival held in june and july. 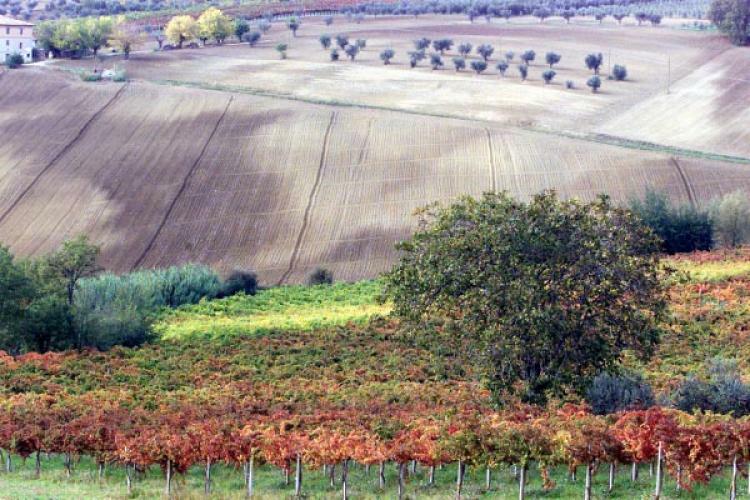 Come back in time for a wine tasting in Montefalco, the area is famous for the Sagrantino Wine. Back roads are the main roads today, as you wend your way over hill and dale, past the tail end of mountain streams, silent forests and wild mushroom stands. 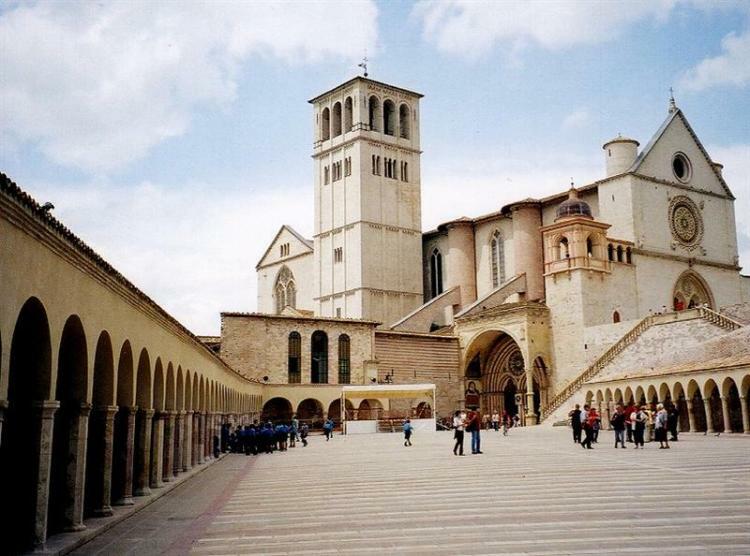 You'll see fewer people today, hear fewer 20th-century sounds and see fewer modern sights than any other day. 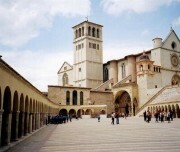 At the end of this unique excursion you'll take the customary uphill incline leading into Todi, whose proximity is heralded by the wonderful Santa Maria della Consolazione, a magnificent Renaissance church set amidst shrubs and treetops on the outskirts of town. Todi still has almost all of its medieval walls, and its pristine charm has made it a favourite country home of wealthy Romans and artists, as well as a host of artisans who have enlivened its streets with their shops. Total Distance: 40 km/25 miles. 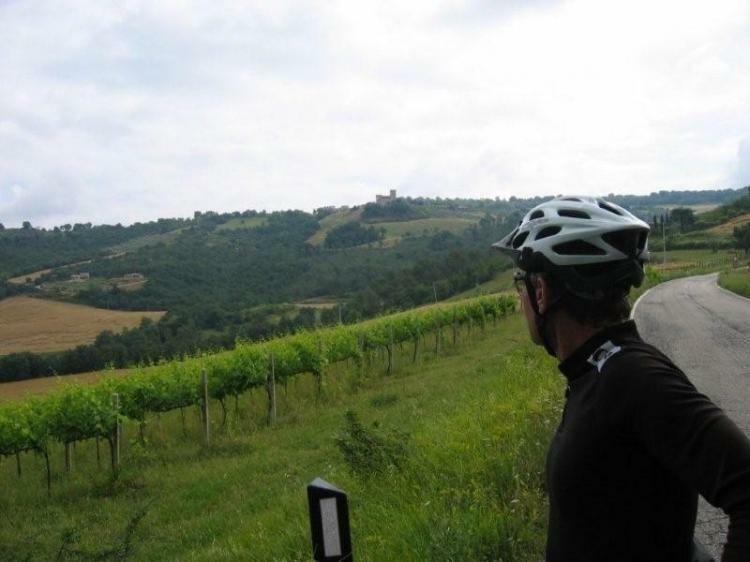 Bike ride from Todi to Orvieto via Prodo Castle. Yet another - perhaps the most glorious - church awaits you at the end of this day, your reward for mastering some pretty steep inclines. Along the way you'll pass several ruined castles which provide a perfect backdrop for a picnic, perhaps based on local salamis, cheeses and breads purchased in the morning. By late afternoon you'll see Orvieto, looming ahead on its strange plateau, crowned by the cathedral of Santa Maria, considered by one and all to be among the very finest churches in all of Europe. 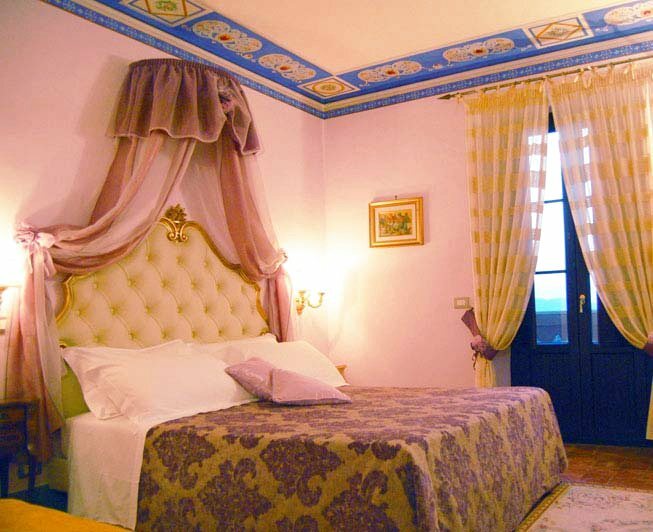 Relais Castelluccio Palusse has a beautiful, hilltop setting just outside Città della Pieve. 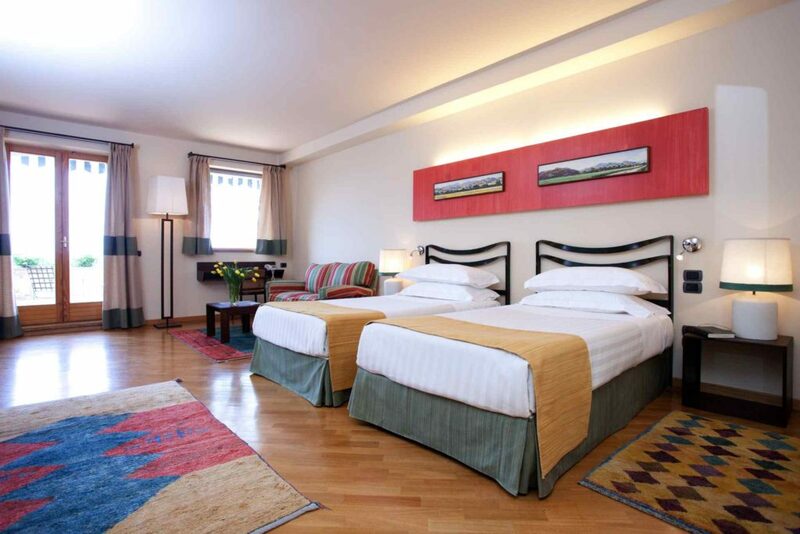 Once a noble residence, it now offers classically furnished guest rooms. 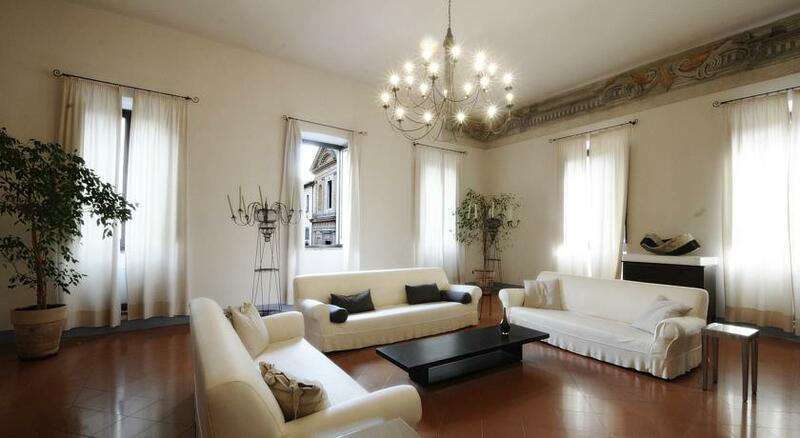 This unique property has been carefully restored to preserve many of its original features. The grand entrances lead you to the many lounges and halls; including the dining hall. Le Tre Vaselle Resort & Spa is a unique 5-star hotel, it stretches over 10 thousand square meters from the historic center of Torgiano up to the park of olive trees. 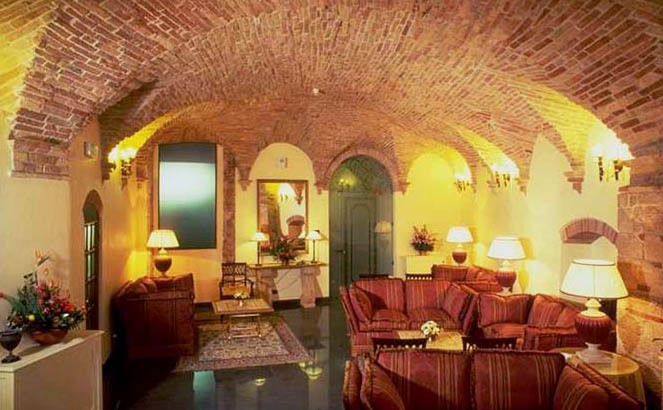 Just re-opened in April 2018 after one year renovation, the hotel is a wine resort connected with wine in all its forms: Bella Uve Wine therapy Spa is the only one in Umbria dedicated to wine therapy. 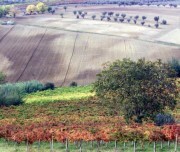 Sangiovese & Sagrantino! 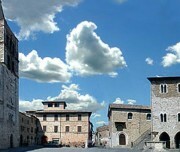 Palazzo Bontadosi Hotel and Spa is set in the main square of Montefalco, inside the 15th-century town walls, it offers an exclusive spa with heated swimming pool.Art gallery on the ground floor, the spa is located in the medieval basement and includes a steam bath and hydrotherapy showers. Hotel Fonte Cesia is the result of the careful renovation of an ancient and noble palace from the 17th century.The previous church of Saint Benedetto,13th century, which adjoins the hotel is today the beautiful frame of a lecture hall. 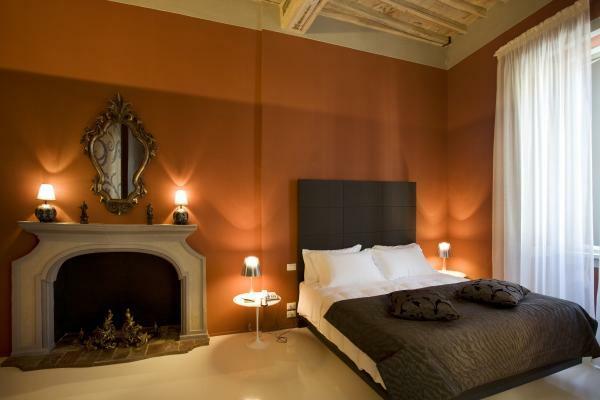 The Hotel Palazzo Piccolomini is remarkable for its beautiful palace created for the pontifical family Piccolomini. The accurate restoration has given new splendour to the different age-long structures; from the refined facade overlooking Piazza Ranieri down to the underground rooms cut into the tuff mass, on which the Etruscan Orvieto rises. 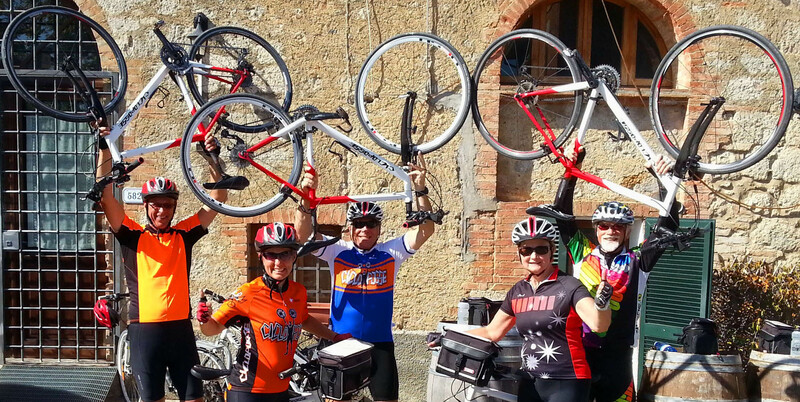 Thank you very much for making my bike trip in Tuscany so enjoyable. 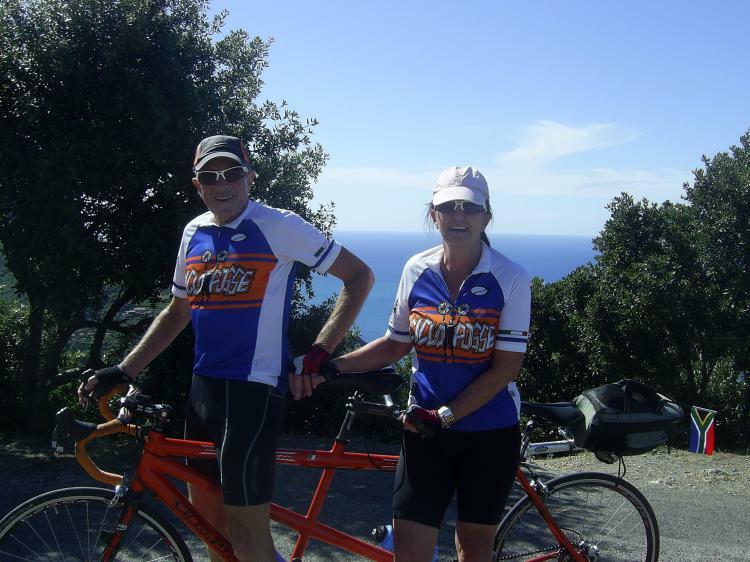 I may try to ride with you in Sardinia next year in late September and early October. You should be very proud of your business and yourselves for being such great ambassadors for your country.